We didn't know it at the time but the SPCA fundraiser event last year at The Beer Yard marked our good ol' girl Logan's last official beer event. Last year's weekend-long event tallied 96 cases and a $1,091 donation. That's pretty good; but, I think we can all help The Beer Yard, Teresa's, and Tröegs do even better than that this year. I think that between the food, the dog collars, the beer, and other miscellaneous donations, we could see at least 120 cases and nearly $1,500 in donations. What do you think? For Logan and all of man's (and woman's) best friends out there, please consider stopping by The Beer Yard sometime before the end of the weekend and contributing to a worthy cause. If you stop by on Saturday from 1pm-4pm, you'll get much more than just a simple taste and fundraiser. There'll be food, snacks, and more. The weather looks pretty decent, plus you need to eat and drink at some point on Saturday anyway, right? 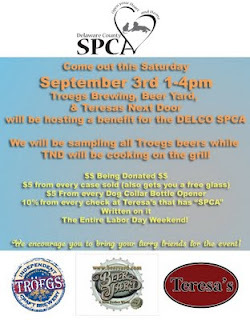 Go to Teresa's and write SPCA and write on your bill and they will donate 10% of your check. As a bonus they are having some great draft beers on this weekend as part of their "End and Odd" weekend. The Famous Nick Johnson will be here doing a sampling of his beers, with hopefully a few surprises. We will be cooking Hot Dogs from Butcher Bill. If you have not had, these are some of the best Dogs you will ever taste. There will be $2.00 donation per dog. By request we will have some of his burgers too, figure a $5.00 donation for them. 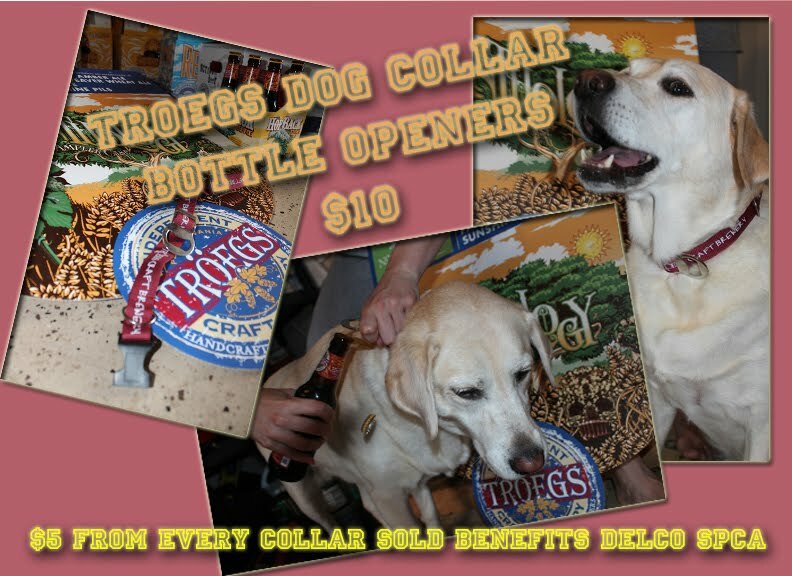 Nick will also have Tröegs Bottle Opener Dog Collars ( <<--click for a picture ) for sale as well, with a portion of that sale going to the SPCA. Please forward this to any and all of your dog loving friends.